Tim Mullooly: Welcome back to Living With Money. This is Tim Mullooly. Last week we had the interview where Tom interviewed me. After the episode aired, we got a couple of questions from listeners saying, “Hey, Tim, why didn’t you get asked your own last question,” stuff like that. We also had a couple other questions that we had to cut for time. For that sake, Casey is sitting in for Tom today. He’s going to be asking me a couple questions just to quickly wrap up our conversation from last week. So this will be episode 63, part two. Casey, thanks for joining me. Casey: Yeah, happy to do it and take it away. I listened to that episode last week, and you didn’t get asked the question, what’s the best piece of advice you’ve ever gotten? The first thing I did was walk into your office and ask you. I know you wrote about it last week, but could you go a little bit more in depth on what the best piece of advice you’ve ever gotten is? Tim Mullooly: Like you said, I did write a post about this, and we’ll link to it in the show notes for anyone who hasn’t read the post. I remember you came into the office and asked me that question. And I was like, “Well, I’m glad I didn’t get asked that question because you stole my answer unintentionally.” That really is my answer to that question. Tim Mullooly: But all these years later, you reflect back on that piece of advice, and it actually makes sense on a higher level. It pretty much to sum it up means you do things to the best of your ability, and if you’re giving it your all, and you’re trying your best, then that’s good. Casey: That’s winning, that’s successful. Tim Mullooly: Right. That’s enough. I figured that would be a cop out answer to just say, “Well, you covered my answer anyway.” Kind of non-answer. So I thought more about it and I figured I would share the piece of advice that I’ve received most recently that I enjoyed the most. Towards the end of the book Self Compassion, which again, we talked about in your episode. Casey: I have heard that it’s good. Tim Mullooly: Yeah. It was a quote, the author quoted Charlie Chaplin, and the quote said, “Life is a tragedy when seen up close, but a comedy when seen in a long shot.” I read that over and over again a couple times, and it really hit home for me a lot of times, I just get so caught up in what’s going on in the moment, tunnel vision, this is the worst thing that’s happening to me. This is all that matters. This is such a big deal. This is crazy. I can’t believe this is happening. Just reading that quote, since then I’ve tried to zoom out in the grand scheme of things like does this matter? Like it’s okay? Something happens, someone cuts you off on your drive to work instead of cursing them out you’re just, “Yeah, whatever.” That’s okay. There’s no use, getting all worked up about the little things. Casey: We talked about it after I read the post, and it’s almost like unburdening yourself when you step back like that. It takes a lot of energy, and it takes a lot out of you to be so hyper focused on yourself, and it is more relaxing and puts you at ease when you can be able to take that step back and laugh at the world. Tim Mullooly: Yeah. If you get caught up in what’s going on, if you’re constantly scrolling through Twitter and Social Media and see, reading all the headlines, getting exposed to everything that’s going on in the world all over the world 24/7 constant basis, that’s exhausting. Casey: It can be maddening. Tim Mullooly: It’s mentally exhausting to have to go deep into all of these topics. It goes back to what I was saying during our episode, you don’t need to have an opinion on everything, and it’s okay to not have one and that’s where I’ve gotten to. There are so many things going on, it’s exhausting and frustrating to try and be hyper focused and care so much about all of them. Casey: I know here at Mullooly Asset Management we focus a lot on putting out content whether that be through podcasts that you do, that my dad Tom and my brother Brendan do, whether it be writing blog posts, we’re focused on turning our content pretty much daily. How do you think about trying to relate these complex topics about investing and finance to everyday people in ways that they can actually understand? Tim Mullooly: Sometimes it gets tough because as finance professionals advisors sometimes we’re speaking in jargon and industry terms, and we don’t even recognize that we’re doing it. I think just being conscious about the words that you’re choosing is probably the first step. I also like to just pick different topics that aren’t finance related and try and tie that in. For example, I relate things to music. I’ve read posts about, and I’ve written posts about how to think about your portfolio in terms of a band, like what represents the bonds and the baseline or the rhythm section. Same thing, I mean, a big one for people is sports. There are endless sports analogies that you can make and type between investing, saving, personal finance, anything really and sports. Casey: When you’re trying to write a post, do you ever see something or have light bulb moments where it’s like, “Oh, this is applicable to finance or investing.” How does it usually take shape? Casey: Yeah, it does make sense now that you say it. 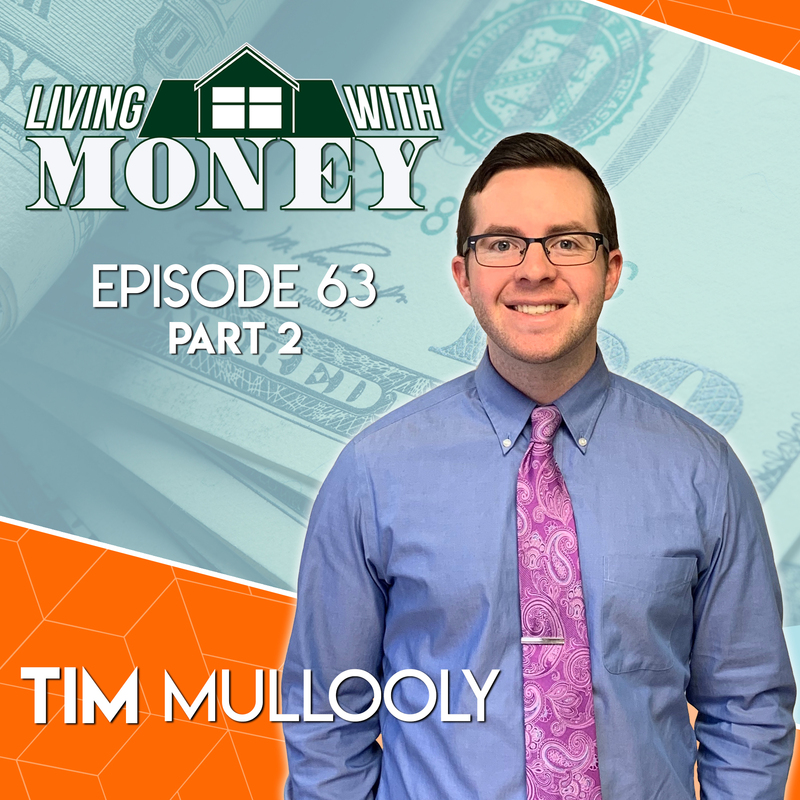 Tim Mullooly: You don’t realize it, I’m reading a post, and I’m reading it, while also seeing the financial ties, or the analogies that could be made into our business, so we can try and translate it for people. Casey: Right. It’s almost like you’re wearing this content generation set of glasses, where you’re just seeing things through the lens of how it ties into finance. Tim Mullooly: Yeah, it’s like a pair of glasses that you can’t take off. I’m not doing it intentionally, but that’s just how it’s gone. Casey: I mean, I think that that is just … it’s true for everything, not just producing content. It’s you see the world, or the world happens as you’re seeing it, and that’s different for everybody. One of the reasons why I think content is so important is because it can generate and start a lot of difficult conversations when it comes to finance and investing and money. It feels almost like a taboo subject. Why do you think it is so hard for people to talk about their finances? Tim Mullooly: First side totally agree. It definitely is taboo. I’ve even found … We talk with clients about their finances on a day-to-day basis, and I personally still don’t like talking about my own finances with you, or dad, or mom. I think there are so many emotional ties, things that people relate back to money. People are constantly just comparing themselves to other people. It’s all about trying to make it seem like you have it all together. Especially I feel for people our age, it gets amplified too, because there are some people who are flaunting stuff on social media, and we’re seeing that all the time. Casey: You don’t want to seem behind the Jones’s so to speak. Casey: So it’s almost like, it sounds you think a lot of people are insecure about their financial situation? Tim Mullooly: Yeah, definitely. I think even people with a lot of money are still insecure. We hear a lot in the industry about the hedonic treadmill, where like, “Once I get to a million dollars, then I’ll be happy.” And then you get to a million dollars, and it’s like, “Once I get to $5 million, then I’ll be happy and like” No one’s ever happy, it’s not the dollar amount, I guess it’s more what you choose to do with it. That is something that I talked about a couple episodes with John Lanza, who runs the Money Mammals. It’s a educational program for kids to try and get them to view money the right way from a young age. He said, “Trying to get kids to view money as a tool and not the goal.” I think that that’s one problem that we all have as adults, whether you’re 25, 26 like us, or 55, 56, you learn it from such a young age that you just need to accumulate more and more, and more wealth, and more money. No one’s defined what the “for what” is in that situation, and I think that that’s why people are insecure. Casey: I mean, that makes a lot of sense. It seems like there’s a scarcity mindset out there almost, where we try and accumulate as much of something money as we can. We just accumulate, accumulate, accumulate, and then that just never stops. We never learn how to be content with what we have, and we think that just because one person is making more money or has more money than me, that that means that there’s less money for me to make. And that scarcity in mindset, I think misleads a lot of people because it tells them exactly that, just because this person is making a lot of money means that there’s less for me to be made, or there’s less opportunity for me, but that’s not true. Tim Mullooly: Right. I think that because people are so insecure with themselves about what the money is actually for and what they’re doing with it. I mean, how can we expect people to communicate those things well with others when they can’t even have that on conversation with themselves? It’s step one, come to terms with yourself about what your money is for, and what your happiness is based on, then you can have successful conversations with other people about it. Tim Mullooly: Easier said than done. Exactly, yeah. Casey: I’m not good sitting here and talking about it but it’s hard to face up to these truths. That seems to be your overall, somewhat of your overall message for living with money is just trying to break down these barriers that we’ve constructed about money, how we treat it, and how we think about it. Would you say that’s the overall goal for the podcast or shed some light on that for us? Casey: let’s have this figured out. Tim Mullooly: Just because you’re 50 years old or 60 years old or 25 years old just out of college, it’s okay if you don’t know certain things. It’s not okay to not actively pursue the answers to those questions that you have. We’re all going to have questions, but you need to actually go out and find answers to them. Hopefully, we provide you some answers on the podcast. Tim Mullooly: Your own end question? Casey: Came up with my own end question. It’s a riff off of Patrick O’Shaughnessy from Invest Like the Best. He asks, “What is the nicest thing anyone’s ever done for you?” But I’m going to ask what’s the nicest thing you’ve ever done for yourself? Tim Mullooly: The first couple things that come to mind are more just recent examples. I’ll go with those. I talked about it in the last episode. On Saturday, I’ll be running a half marathon in Asbury. Tim Mullooly: Like I said in the last episode, I’m not a runner, never really have been. But it’s something that I always wanted to give it a shot, that I think in a way forcing myself to do that is one of the nicer things that I’ve done for myself, even though at the time it was a big daunting task. Casey: And the runs probably don’t feel nice. Tim Mullooly: No, they were okay physically, up until when I was doing 10 and 11 miles. Then at the end, your legs are achy and stuff, but yeah, it was tough. It’s tough work doing it in the winter too, training last couple of months while it’s cold and dark. Forcing myself to set a goal, something that I’ve always wanted to do, it gave my life a little bit of structure the last couple of months, like I was working towards something. It’s always good to give yourself some structure, some purpose. And then also is something that caused me to be more self-reliant and just focus on myself because it’s not a team sport. I love team sports. I played team sports all the time but, it’s something that I had to do for myself, no one could go out there and carry the load for me. Casey: It’s just you out there. Tim Mullooly: … something that I always wanted to do. I had drums and singing down, but those I always say, I always joke, those are the two musical things that you can’t really write songs with. There’s not many songs with just drums and vocals, so I needed something else. The guitar has been along the same lines, added a little bit of purpose and opening up a whole new side of music that I had yet to be exposed to. Those are probably the two things that are most recent on the nicer side for myself. Casey: Really cool. It’s weird though, because it’s like both of those things are giving yourself the gift of pain or being uncomfortable. So it doesn’t necessarily seem like a nice thing for yourself, but I feel like most people’s answers would be along those lines too. Doing something that gets you out of your comfort zone, therefore it’s more rewarding. Tim Mullooly: It’s strange. I just thought of this now, but if you think about doing something nice for someone else, I bought them an ice cream cone or something or like I got them this right. I gave them this. But if you think about doing something nice for yourself, it’s I forced myself to run a half marathon or learn some tough lessons. What you give yourself is very different from what you consider nice to give someone else. Tim Mullooly: I don’t know how to unpack that, and I don’t think that we’re going to dive into that. If I come up for an answer with that, I’ll write about it, blog about it, or maybe we’ll catch up with that on another episode. Tim Mullooly: Any other last questions Casey? Casey: That was all I had for you. Tim Mullooly: All right. Thanks for tuning into this part two episode of Living With Money. Thanks for tuning in.